The Huggington Post report this morning that the number of children who have taken up smoking has risen by 50,000 in just one year, research suggests. Almost one in three (27%) of under-16s have tried smoking at least once, a study by the charity found. It urged the Government to commit to putting all cigarettes in plain standardised packs. Last April, the Government launched a consultation on plans to introduce mandatory standardised packaging for tobacco products. Health campaigners have welcomed the proposal, but opponents claimed it would lead to increased smuggling and job losses. Sarah Woolnough, executive director of policy and information at Cancer Research UK, said: "With such a large number of youngsters starting to smoke every year, urgent action is needed to tackle the devastation caused by tobacco. "Reducing the appeal of cigarettes with plain, standardised packs will give millions of children one less reason to start smoking. "These figures underline the importance of sustained action to discourage young people from starting. "Smoking kills and is responsible for at least 14 different types of cancer. Standardised packaging is popular with the public and will help protect children. "We urge the Government to show their commitment to health and introduce plain, standardised packs as soon as possible." In December, Australia became the first country in the world to put all tobacco products in standardised packs. Anti plain pack ads banned as "misleading"
A number of publications including Campaign Live have reported adverts challenging the Government's proposals for plain, standardised packing produced by JTI have been banned by the Advertising Standards Authority. The ads are said to be "misleading" and lack "substantiation". Benson & Hedges and Silk Cut-owner Gallaher has had three ads challenging the Government's proposals for plain cigarette packaging, banned by the ad watchdog. The ads, created by Big Al's Creative Emporium, were banned on the grounds that they had breached the CAP code and were "misleading" and lacking in "substantiation". Gallaher, which includes Benson & Hedges and Silk Cut among its brands, released three national press ads claiming there was "no evidence" that plain cigarette packaging would discourage young people from buying cigarettes. Text in one of the ads stated: "This same policy was rejected in 2008 because there was no credible evidence." 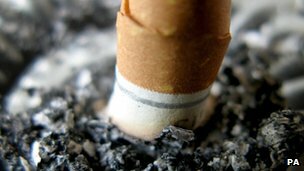 The company said that after the 2008 Consultation on the Future of Tobacco Control, the Government had considered and put forward a range of control measures, including a ban on displaying tobacco products for sale, but had not taken forward proposals to introduce plain packaging for cigarettes. Gallaher, which is part of Japan Tobacco International (JTI), also highlighted various statements made by ministers after the 2008 consultation was published, which they said reinforced the fact that the Government had rejected the idea to introduce plain cigarette packaging. In one such statement, they quoted Alan Johnson, the secretary of state for health in 2009, who said: "There is no evidence base that it [plain packaging] actually reduces the number of young children smoking. "We want to keep that under review, and when there is an evidence base for it, it could well be another important measure to meet our goal, which is to reduce the number of young people smoking." This they interpreted as a rejection of the policy. However, the ASA’s assessment concluded that Gallaher’s assertions in the ads that the Government had strictly rejected the proposals were incorrect and misleading, as Johnson had said the proposals would kept "under review" and "could well be another important measure". The ASA also verified with the Department of Health (DoH) that this was the Government’s current position on the matter. The DoH advised that, while the proposal was not pursued in the new [2008/9] legislation, the Government had kept open the potential for it to be pursued at a later date and it was not correct to say there had been an outright rejection. The ASA ruled the ads must not appear in their current form and told JTI not to claim the Government had rejected the policy of plan packaging and not state or imply it had not been introduced because of a lack of evidence. A statement issued by JTI said that it was disappointed by the ASA's decision and that it would not use the advertisements again, but that it would not withhold from voicing concern on the issue in the future. The legislation, to be announced in the Queen's speech in May, is also expected to ban smoking in cars carrying anyone aged under 16 years. Ministers acknowledge that the ban is likely to be difficult for the police to enforce, but they believe peer group pressure will have an impact similar to the ban on drivers using mobile phones. David Cameron referred to the possibility of introducing plain packaging last week, without putting a timetable on it. Ministers are convinced that the ban is necessary to take the next step to reduce smoking in the UK. The move comes after a Lancet study of 19 countries found the UK falling down the health wellbeing league table. It found Britain's pace of decline in premature mortality has fallen well behind the average of 14 other original members of the European Union as well as Australia, Canada, Norway, and the United States over the past 20 years. A key reason was the durability of a range of public health issues, including diet, drink and drugs. Smoking causes over 100,000 deaths every year in the UK and the Policy Exchange thinktank has estimated it costs society £14bn. Despite a massive reduction in the numbers smoking since the 1950s, it is still estimated that one in five British people smokes. There is already a complete ban on cigarette advertising, and in one of the Labour government's most controversial moves, smoking in public places was also banned. The 2009 Health Act ended open display of tobacco products, mainly in supermarkets, from April last year and will come into force for all other shops from April 2015. Ministers are also looking to see if the troubled families unit headed by the families tsar, Louise Casey, can start to design interventions to improve the diets of some of the 120,000 families it is already seeking to help. Research shows that poorer families are far more prone to obesity, and immune to public health messages. In schools research is showing that it is wealthier families that are taking up healthy food options. 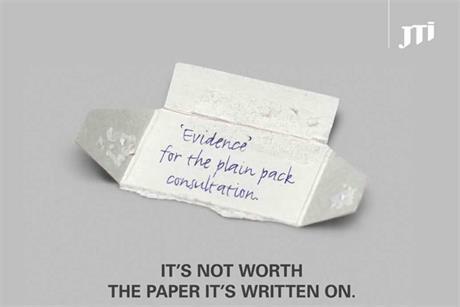 The Department of Health started a consultation in March 2011 on plain packaging which ended last August last year. Research for the department by the University of Stirling found that "plain pack colours have negative connotations, weaken attachment to brands, project a less desirable smoker identity, and expose the reality of smoking". The study also found that non-smokers tended to find plain packaging less appealing than did smokers, and younger respondents tended to find it less appealing than did older respondents. Around two thirds of smokers say they started smoking before they were 18. Since December in Australia cigarettes must be sold in uniform drab olive-green packets with graphic health warnings. The only marker of difference between products is the brand name written on the packet in a uniform style. New Zealand has promised to follow the Australian lead. The Australian attorney-general, Mark Dreyfus, has defended the packaging saying "it is anti-cancer, not anti-trade". There has been some evidence that smokers are now trying to cover up the packaging with plasters.